Whew! Where have I been the last two and a half weeks? Well, I've been reading The Moonstone by Wilkie Collins...really...slowly... It's not a difficult read at all. I loved it and plan to keep it for many years of rereading enjoyment. I've just been so busy that there's not been a lot of time for reading---or reviewing. Before I get to the review, I have to note that I just found out there's a BBC version of this featuring John Wise, the not-so-nice Willoughby from the 1995 version of Sense & Sensibility. Must find this! Second random note---take a minute to Google search the images for The Moonstone. Lots of different book covers---all depicting significant scenes from the book. It's one of the most varied mix of covers I've seen. 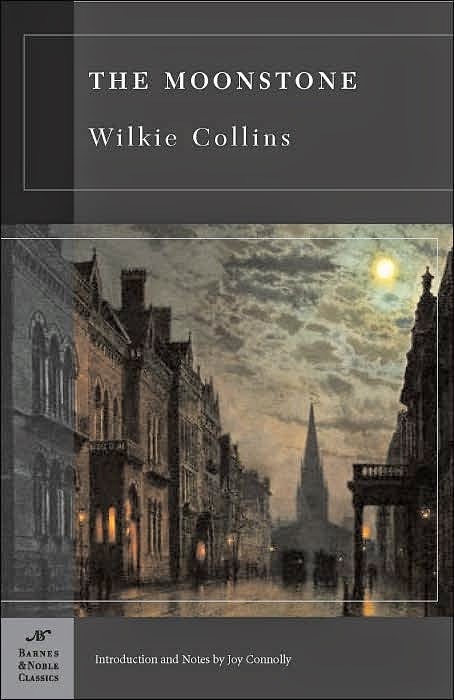 Book Description: "Alongside Edgar Allan Poe in America, Britain's Wilkie Collins stands as the inventor of the modern detective story. The Moonstone introduces all the ingredients: a homey, English country setting, and a colorfully exotic background in colonial India; the theft of a fabulous diamond from the lovely heroine; a bloody murder and a tragic suicide; a poor hero in love with the heroine but suspected of the crime, who can't remember anything about the night the jewel was stolen; a lawyer, a doctor, a sea captain, and assorted friends, relatives, and servants--all of them suspects; and, most essentially, a bumbling local policeman and a brilliant if eccentric London detective. Adding spice to the recipe are unexpected twists, a bit of dark satire, a dash of social comment, and an unusual but effective narrative structure--eleven different voices relate parts of the tale, each revealing as much about himself (and, in one case, herself) as about the mystery of the missing Moonstone. Filled with suspense, action, and romance, The Moonstone is as riveting and intoxicating today as it was when it first appeared more than a century ago." "Here follows the substance of what I said, written out entirely for your benefit. Pay attention to it, or you will be all abroad, when we get deeper into the story. Clear your mind of the children, or the dinner, o the new bonnet, or what not. Try if you can't forget politics, horses, prices in the City, and grievances at the club...Haven't I seen you with the greatest authors in your hands, and don't I know how ready your attention is to wander when it's a book that asks for it, instead of a person?" Later, Miss Clack takes over---a self-righteous, yet hilarious woman. Her "BookCrossing" escapade through Mrs. Verinder's house cracked me right up! I do have to say that the non-smoking, opium-induced theory was a little out there, in my opinion. However, taking into consideration the time in which this was written, it probably wasn't too far of a leap for the author to take. My favorite quote in the whole book is this: "Speaking as a servant, I am deeply indebted to you. Speaking as a man, I consider you to be a person whose head is full of maggots." Bwahahaha!! Love it! This one comes highly recommended---definitely get your hands on a copy and prepare to enjoy! 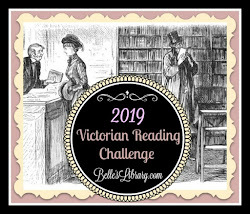 This fulfills my goals for the Full House challenge: published pre-2000, the TBR challenge (book #4), and the New To You challenge for new author. Read more about my 2015 reading challenges here. Of course! It's already in your box!